Hello friends. I'm thrilled to have been asked to participate in Blogathon Canada 2013, which will be coming in November. 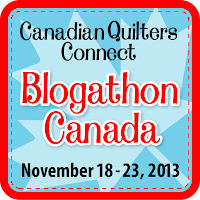 Blogathon Canada is a week-long celebration of Canadian Quilting Bloggers brought to you by Sew Sisters Quilt Shop. In its second year, Blogathon Canada celebrates the tremendous craft, talent, and passion of the online quilting community in Canada. Each day host bloggers will introduce themselves and their work on their blogs. They will include links to more blogs from their province so you can visit those blogs as well. The host bloggers will also host a giveaway of some of their favorite goodies from Sew Sisters so you have a chance to win every day of the week! This year Sew Sisters has teamed up with Aurifil, Northcott and Robert Kaufman to bring you even more fantastic giveaways! Check out their blog for more and see how you can join the party! Go to Sew Sisters Quilt Shop. Everyone will be welcome to participate in the Blogathon giveaways, not just Canadians. I hope to see you back on November 18 when the event kicks off. Looks like fun! I'll be back, and visiting the others too! I'm happy to be representing BC along with you to kick of the Blogathon! Wow this is such an awesome idea! I can't wait to see some of the other Bloggers that are participating. Looking forward to reading your post in November, thanks very much for the heads up! Yay! I can hardly wait, Heather. It's going to be great! What a great group of bloggers on this list!! Looking forward to following yours now Heather! Hello Heather! Nice to meet you! Looking forward to discovering what you are up to. Found you through the Blogathon Canada. PS. Your wallet looks fantastic!